As expected, the Federal Reserve Open Market Committee (FOMC) hiked the fed funds rate at their September 26th meeting by 0.25% to a target range of 2.0%-2.25%. This marks the 8th increase since the process started in December 2015 with current bets on one more hike in December, another three next year and then twice more in 2020 before reaching a neutral policy position - neither accommodative nor restrictive. The fed is not trying to throttle back the economy but is instead attempting to normalize interest rates from all-time lows reached during the Great Recession of 2007-2009. This attempt to get interest rates up and keep the economy rolling along is a delicate balancing act from which a mis-cue could result in hyper-inflation or an unintended recession. When the next recession eventually does arrive, if rates are too low, the fed will simply not have as many tools in its monetary toolbox to re-stimulate growth. The third quarter continued the momentum from 2Q18 as earnings, dividends and share buy-backs kept marching upward. U.S. companies delivered robust quarterly returns ranging from a low of 3.86% by mid-sized companies (S&P 400) to a stellar 7.71% gain by our largest companies (S&P 500). Developed international markets (MSCI EAFE) gained a modest 1.35% and emerging markets (MSCI EM) lost -1.09% during the period. International markets are struggling from headwinds associated with rising U.S. Treasury yields, a strong U.S. dollar, rising oil prices, trade wars and recent crises in Turkey and Argentina. Year-to-date, small-cap U.S. companies (S&P 600) beat all comers with an impressive 14.54% gain. 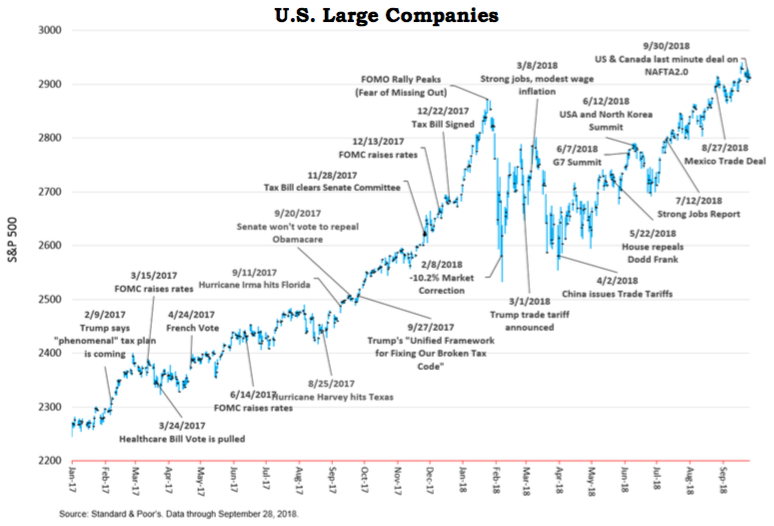 Smaller companies have benefited the most from the tax law changes and the current political environment since they are not as negatively impacted by tariffs when compared to larger, globally integrated companies. As stated previously, international markets are lagging, with emerging markets off -7.68% through the year’s first nine months. However, last year those roles were reversed, as emerging markets out-performed all major sectors and small U.S. companies brought up the rear. This is a good illustration of why we construct broadly diversified, market-neutral portfolios and then periodically rebalance, trimming back top performing sectors and adding to laggards. Rebalancing is a form of contrary investing designed to keep risk in check, but it can also enhance returns. Data from ISI Evercore Research, which tracks buying and selling of mutual funds and exchange-traded funds (ETFs) continues to show more money coming out of stocks than going in. This flow of funds combined with continually increasing earnings has contributed to an improving equity valuation picture. For the year 2018, earnings data from Thomson Reuters shows the forward P/E (price/earnings) ratio for the S&P 500 has dropped from about 19 to just under 17 currently. The financial media frequently sound the alarm of a potentially over-heated market, but investors should note that excess optimism tends to accompany such markets and this market appears to be lacking such exuberance. Despite constant, negative journalistic noise, the U.S. economy is doing just fine, thank you. Our growth rate, as measured by GDP (Gross Domestic Product) hit a whopping 4.2% annualized rate in 2Q18 which was an upward revision from earlier estimates. Growth was broad-based, including capital investments in Intellectual Products (+10.5%), Exports (+9.3%), Equipment (+4.6%) and the all-important Personal Consumer Spending (which rebounded to 3.8% from 0.5% in Q1). GDP is expected to come in around 3.5% in 3Q18 and then slow next year as the economic boost from the tax stimulus begins to fade. 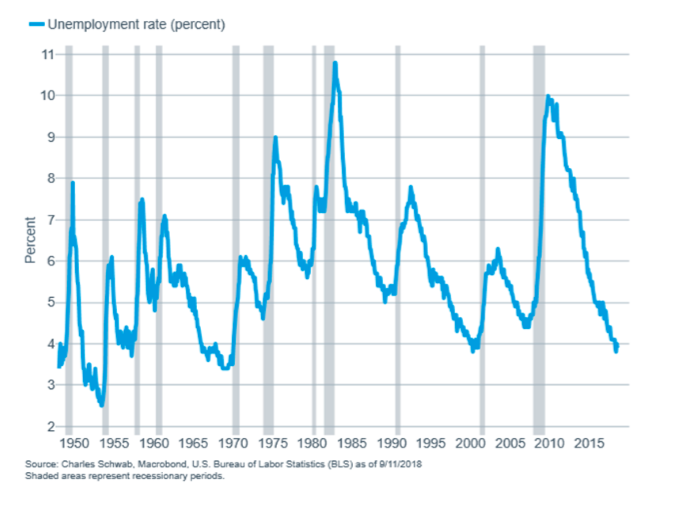 The latest unemployment reading of 3.9% is considered full employment and yet is expected to fall even further in 2019 to 3.5%. Inflation, while firming, has not rapidly accelerated, remaining in the 2% range. Wage growth (August year-over-year 2.9%), a concern for potentially rising costs, was offset perfectly by a 2.9% increase in productivity. Additionally, many companies are choosing to hold the line on price increases to avoid losing market share. There continues to be more U.S. job openings than there are unemployed people. Employees today are leaving their current jobs confident they will find a better one. Coined as “job leavers”, their percentage of the unemployed is up to 14%, which is the highest since October 2000. In keeping with that, the number of employed people working part-time for economic reasons (not because they wish to) continues to fall. Interest rates are slowly ticking up as the fed pushes on the short-end of the maturity spectrum trying to normalize rates. However, longer-term yields are not moving up in tandem with short-term rates resulting in a flattening of the yield curve. 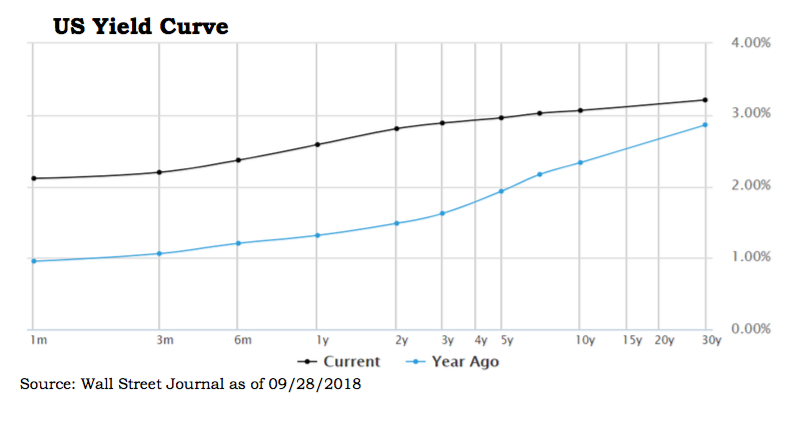 The yield curve is a graphic depiction of interest rates by maturity, with a normal shaped curve showing longer bonds yielding significantly more than shorter bonds. Investors typically demand a higher yield for longer bonds to compensate for inflation and interest rate risk (the potential opportunity cost from locking in a fixed-return over time). As the curve flattens it indicates that market participants (buyers and sellers of bonds) may not share the FOMC’s confidence about our economic prospects. If short-term rates go above longer-term rates that is referred to as an inverted yield curve and often precedes a recession. Wealthview Capital’s fixed-income strategy has been to minimize interest rate risk by keeping our average maturities short. We prefer to take our risk in equities, utilizing bonds in the current (low interest rate) environment to temper equity volatility and provide a source of income and liquidity. Our bond benchmark (Bloomberg Barclays 1-5 Year Government/Corporate Index) returned +0.26% and -0.07% for the third quarter and year-to-date, respectively. Trade issues continue to dominate the news, as the U.S. and China take turns imposing new tariffs on each other. At the last minute prior to the 09/30/18 deadline, Canada agreed to terms of a new trilateral NAFTA (North American Free Trade Agreement) agreement dubbed the USMCA (U.S.-Mexico-Canada Agreement) or Nafta2.0 which seeks to correct many of the flaws from the former agreement. Strong earnings and sales define the U.S. market with equity indexes closing at new highs throughout the third quarter. According to Standard and Poor’s approximately 80% of S&P 500 companies beat their 2Q18 operating estimates and per share earnings set a third consecutive quarterly record, with 3Q18 expected to produce a fourth such record. The latest small business optimism survey revealed that 62% of small businesses are trying to hire, with 89% struggling to find qualified applicants. Also, capital investment plans among small businesses is at its highest level since 2007. Employers continue to add to payrolls, showing business confidence is superseding trade anxiety. For the past year, an average of 200,000 jobs have been added per month and consumer confidence is at its highest level in 18 years. Although an unforseen economic, political or geopolitical event can temporarily derail progress, the current environment of strong growth, modest inflation, low interest rates and high confidence bodes well for continued positive momentum. Best wishes for a pleasant fall.